Twenty years ago, before this company had a name, it all started with an engineering problem, not a business plan. The question at hand was “How do we send email faster,” not “how do we make money from email.” There is a very significant difference between those statements, and that is core to the SparkPost success story. 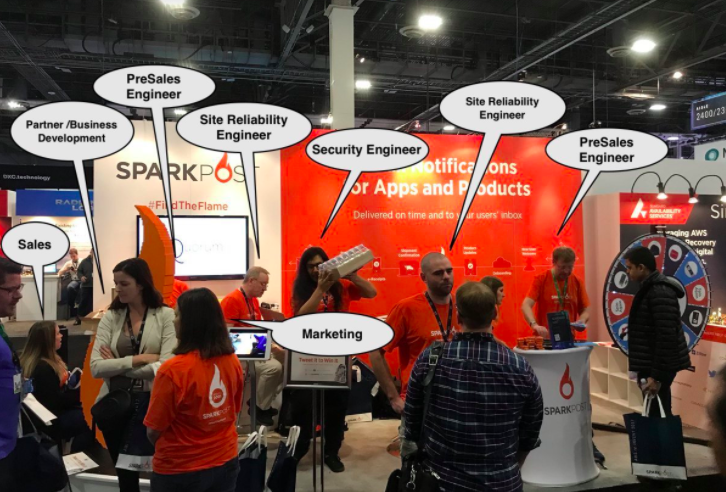 Many organizations are driven by sales and marketing, but SparkPost is Engineering driven. 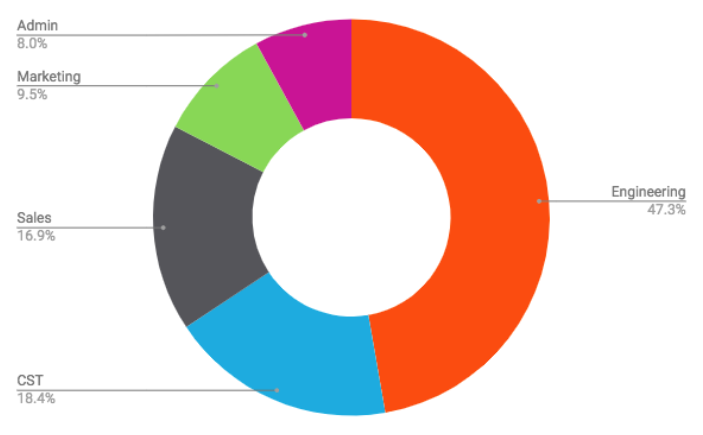 In fact, if you break down the functional teams by percentage, nearly half the entire staff is Engineering. The next largest group is the Customer Success Team (CST) who, as the name suggests, are entirely focused on our customer’s success. In reality, both of those teams report to the CTO which says a great deal about our commitment to engineering excellence for our customers. The Sales team consists of about 16% of staff and the Marketing and Administration teams both occupy less than 10% of that structure each. Our engineering team is continuously pushing the envelope to see how much performance we can squeeze out of an environment. Sometimes pushing the boundaries results in breakage, but as my ski instructor once told me, “if you don’t fall, you are not trying hard enough.” When that happens, we fix it, make sure it won’t happen again, then try to educate others about what happened and how to avoid it. I have a great deal of respect for business leaders that can show that much transparency. It should be an inspiration for any entrepreneur looking to build a startup. From the comments above you might assume we focus entirely on engineering without investing in the other critical parts of the business, but nothing could be farther from the truth. We support each other and encourage growth through lateral moves between teams. Engineers often staff trade show booths, allowing them to get first-hand feedback from users. Marketing blogs often see contributions from Sales, Engineering, and Deliverability. Sales conversations typically include guests from Product Development, and it doesn’t stop there. Our Pre-Sales and Technical Account Management teams routinely meet with key members of Marketing, Engineering, and Administration to ensure our customer focus is accurate and relevant, taking customer feedback to product development in real-time. It all boils down to empathy. When companies work in silos, their teams get disconnected and cannot focus together on what is important – the customer. Our people are encouraged to share between groups, bring concerns up when necessary, and learn from each other. Our focus on solving customer problems almost always leads to cross-disciplinary teams where we can discuss the issue from different points of view. It all leads to a better product for the customer. You may have noticed throughout this post there are a scattering of bold orange words. These are words that highlight the SparkPost culture, and we try to live them every day. We document our culture in a list of values we all believe essential as seen in the posters that cover our office walls and are listed in detail at the end of this post. Our culture was not drawn out in a boardroom as part of a vision and mission statement exercise, but rather describes everyone we invite to join our extended family (some companies call that “hiring”). If you think you live these qualities and want to spend your creative time with like-minded people, let us know – we are hiring. Respect – For yourself, your co-workers, and our customers. In every note, chat, discussion, and interaction. With respect comes trust, and all good relationships are built on trust. Commitment – Deliver on your promises. Work passionately and with commitment until the job is done. Empowerment – Question everything around you, make suggestions, and be empowered to improve, innovate, and succeed. Transparency – Be open and honest. Over-communication makes for clear understanding. Communicate successes as well as failures and challenges. Success – Measure success through raving fans. We succeed because we help our customers solve their pressing business issues. Support – Assist your colleagues. The job isn’t done until everyone is done. We pitch in to help others; anything else is failure. Growth – Learn from mistakes and focus on moving forward. Look back only long enough to understand why, then we move forward. Inspiration – Be the change you wish to see in the world. None of us is perfect. If you are the first to make the right call, you won’t be the last.